Cheap and plentiful. US annual household food expenditure, 2016. On an average, a US household spends $600 on food per month, almost half of which goes in eating out. 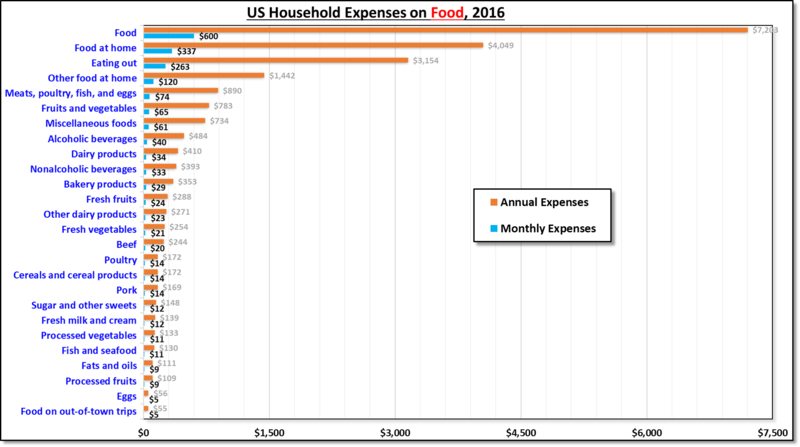 Out of the $57,311 annual expense for an American household, only about 13% ($7,203) is spent on food. Every month, the 125 million US households spend on an average of $600 on food. That’s relatively low compared to developing countries where a significant income goes in feeding the family. In fact, the bigger expenses for a family are housing ($18,886) and transportation ($9,049). US also has a strong culture of eating out and almost 45% of the expenses go into eating outside their own home. Even when eating at home, almost a third of the food is either pre-cooked or packaged. As would be expected for a western country, the expenditure in eating meat (almost 12%) is higher than vegetables (10%) and twice as much as dairy products (5%). Beef is the most popular meat, and one of the biggest industry supported by the great plains of the western and mid-west United States. The US annual household food expenditure data suggest Americans spend only about 3% of the food expenses on sugar & oil. However, a significant amount of calories in the food outside home come from these high calorie ingredients. Most popular among these sources are carbonated drinks. It is very common to find added sugar in almost everything in United States, including yoghurt, fruit juice, and bread. These ‘cheap’ calories are under intense debate due to very high ratio of population facing obesity and overweight problems. As previous data suggested, almost 8% of the household expense goes into paying for healthcare. Ten percent of the food expenditure goes in beverages, although less than half of it is related to alcoholic beverages. The use of alcohol peaks around age 30, slightly higher than other western countries due to a higher drinking age limit of 21 years. This data is a good reference for those looking to compare their own expenses against the US average in 2016. See more charts at the home page.